Stealthy Mom: Omega No-Bakes (vegan, gluten free) Updated! Omega No-Bakes (vegan, gluten free) Updated! 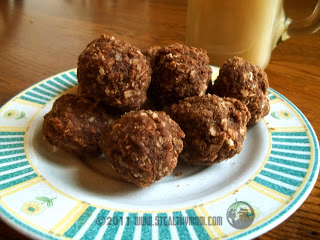 One the first and most popular posts on the Stealthy Mom blog was our Omega No-Bakes recipe: fudgey little chocolate and peanut butter cookie balls that each contained about a teaspoon of flaxseed and a tablespoon of rolled oats. Today we tweaked them a little bit. We switched the white sugar for sucanat (evaporated cane juice) and the olive oil for avocado oil. Sucanat is sugar's minimally processed relative, and avocado oil has no taste and is stable at a higher temperature. We added a bit more plain peanut butter. G-man and the Cadet were scooping up the No-Bake as fast as I could roll them. Indeed, when still warm, they were pretty gooey and yummy. The sucanat gave them a rich molasses flavour that worked well with the chocolate and peanut butter. After chilling, those that made it to the fridge set up well. Turn off the heat, and quickly stir in the flaxseed meal and peanut butter. When the base is smooth, stir in the rolled oats. I shared this post with these weekly natural food recipe round-ups: Hearth and Soul Hop, Fight Back! Friday and Slightly Indulgent Tuesday. It's lovely when a treat has so many wholesome ingredients! Your Omega No Bakes sound delicious and it's lovely they are both vegan and gluten free. Thank you for sharing this delicious recipe with us at the Hearth and Soul hop.